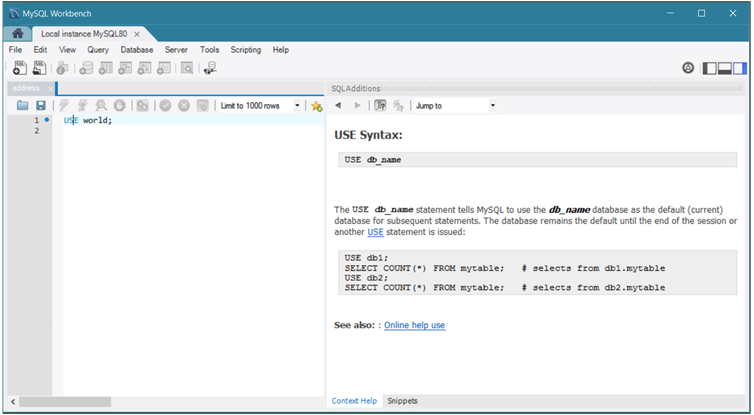 Within the visual SQL Editor, you can select a keyword or function in your query to open a help topic describing its syntax and usage. The level of information is equivalent to typing help keyword at the mysql prompt and the content is specific to the release series (5.6, 5.7, or 8.0) of the current MySQL connection. Context help requires no MySQL connection to use because the context help is stored locally. To view context help, first open the SQL Additions panel by clicking View, Panels, and then Show Secondary Sidebar from the menu. Alternatively, you can click the panel shortcut ( ) from the toolbar. This panel has two bottom tabs; select Context Help. You have several options for displaying context help: automatic, manual, and most frequent list. Initially, automatic context help is disabled. Automatic context help. To enable automatic context help, click the automatic context button ( ) from the SQL Additions toolbar. As you click on or near different SQL keywords and functions in the editor, the context help shifts to the specific topic. Manual context help. Manual context help is available when automatic context help is disabled. Click on or near the SQL keyword in the editor and then click the manual context button ( ) from the SQL Additions toolbar to view each new topic. Most frequent list. Use the drop-down list to select a help topic for display. The set of SQL keywords in this list is predefined. Most frequent keywords, when selected in the SQL editor, also display in the list box. Less common keywords display Jump To in the list box when selected from the editor in either automatic or manual mode. The SQL Additions toolbar also includes forward and reverse arrows that enable you to browse recent content help topics. The following figure shows an example in which automatic context help is enabled and open. Note that when automatic context help is enabled, the manual context button is disabled.